The Granada was packed with spectators last Sunday afternoon for State Street Ballet’s matinee production of The Jungle Book. Many in the audience were children, some of whom were clad in animal print clothing celebrating their favorite characters. A few may have been aspiring ballerinas, but you didn’t have to be one to enjoy the fun of this show. Although it contained some somber moments, the production’s overarching mood was playful, and the dancers-dressed in A. Christina Giannini’s stunning, elaborate animal costumes-made a superb show of skill throughout the performance. The backdrop remained fixed, but set designers used colored lights to create changes in mood from the silky, sophisticated movements of Leila Drake as Bagheera the panther to the raucous buffoonery of the monkeys, led by Sergei Domrachev as their king. 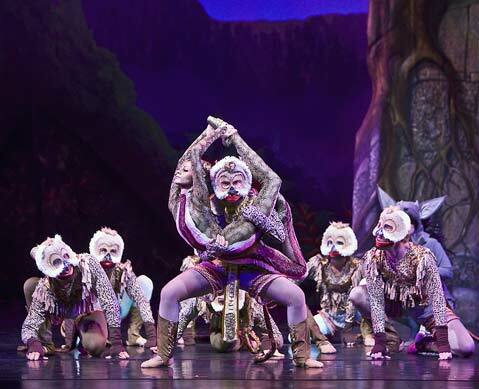 Delighted squeals from the audience confirmed their appreciation of Rodney Gustafson and Gary McKenzie’s choreography, particularly during solo performances by Jose Edwin Gonzalez, who played Mowgli. He never missed a beat, performing seemingly endless jumps, spins, and twirls across the stage, and pulled off a couple of marvelous scenes with the fair maiden Messua, played by Jennifer Rowe. Some of the synchronized scenes involving many characters were a bit confusing, but the village girls who danced with Rowe brought harmony to their ensemble work. Victoria Luchkina, in the role of Kaa the snake, delivered a truly standout performance, seamlessly transitioning from one impossible pose to the next in a slinky costume that did much to accentuate the fluidity of her character. Combined with Milan Svoboda’s fun, original score, the entire company’s engaging acting and dancing skills whisked viewers into the fanciful drama of Rudyard Kipling’s classic tale. Relationships and alliances unfolded, and in the end, all of the characters converged to help Mowgli defeat the evil tiger Shere Khan-played by Bayaraa Badamsambuu-leaving the young audience with a notion that it’s best to join forces when facing a big challenge. With only one month to prepare for this show, State Street Ballet’s dancers certainly modeled such a group effort, with dazzling results.